Mammoth Blood? Russian scientists say yes. A team of Russian scientists claim the carcass of a female mammoth found last month on Lyakhovsky Island of Novosibirsk archipelago contained blood so well-preserved it flowed from the remains, according to a press release from the scientists’ home university, North-Eastern Federal University in the Siberian city of Yakutsk. Additionally, the scientists say that the carcass featured soft tissue so well-preserved it bore the red coloration of fresh meat. Only the upper part of the body, head and left hind leg were skeletonized, according to the release. Some scientists greeted the news of the discovery with skepticism, saying that the likelihood of finding an intact wooly mammoth carcass with preserved genetic material—like that found in flesh and blood—is unlikely, given that the creatures are believed to have gone extinct roughly 10,000 years ago. "What makes the news here is that they have the liquid," Stephan Schuster, a biologist at Penn State who helped decode the woolly mammoth genome several years ago, told NBC News. "But this could also be water that is now thawing and is running out with organic compounds that are in the carcass." 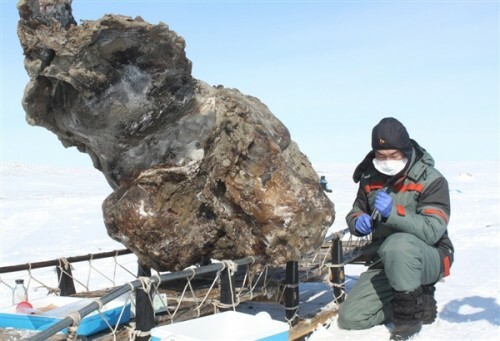 But the lead scientist, Semyon Grigoriev, who is one of the leaders of the Russian-Korean "Mammoth Miracle" cloning project, said in the release that some of the material collected could be useful to the mammoth cloning project. “It was important to discover the mammoth in cold weather because the unique discovery would melt in summer or autumn, and the priceless material for the ‘Mammoth rebirth’ project could disappear from thawing and wild animals,” said Grigoriev. The team said the best-preserved part of the mammoth—her lower body—was encapsulated in pure ice, while upper body, which was in worse shape, was found in the tundra. The researchers collected the samples of the animal’s blood in tubes with a special preservative agent. Nonetheless, Schuster remained skeptical in his interview with NBC News. He maintains that the best places to find mammoth DNA have been from the teeth, bones and hair rather than from the muscles or tendons. More, no scientist has discovered a genetic sample from a mammoth that has not been “completely shattered,” he said in the NBC article. "The maximum we find is 100 base pairs, maybe 400 base pairs. You would need on the order of millions of base pairs, and there's no such thing." Even if the DNA isn't intact, it may still be possible to extract proteins from the tissues, just as proteins were extracted from the fossilized bone of a Tyrannnosaurus rex several years ago. Schuster said working toward that goal would be exciting as well as realistic.